Proving many experts’ forecasts wrong, large parts of Europe are witnessing population growth rather than stability or decline. Hannes Weber notes that this is having detrimental effects on the environment in Western Europe, but less so in the demographically declining central and eastern European countries. Cities and rural regions with growing populations are finding it difficult to reduce their environmental footprint as pledged in the Paris agreement and the UN Sustainable Development Goals. Back in December 2015, in Paris, the world vowed to limit global warming to 2°C compared with pre-industrial times until the year 2100. But there is currently no indication that this goal will likely be reached (Victor et al. 2017). Even a country like Germany, often perceived as a pioneer in green energy, has by and large failed to meet its own climate goals. The latest report by the German government on Germany’s “National Sustainable Development Strategy” openly admits that the goal to reduce carbon dioxide (CO2) emissions by 40% between 1990 and 2020 is unattainable. In many parts of Germany, as well as other European regions, emission levels are stalling or even increasing rather than decreasing. Similarly, efforts to limit soil sealing or preserve biodiversity have been utterly unsuccessful so far. CO2 emissions and urban land conversion are both seen as major impediments to the fight against climate change. There are many reasons for this failure. For instance, despite extensive investments in green energy generation, Germany still depends on coal-fired power stations. Moreover, consumers do not seem to be changing their habits regarding energy-intensive consumer goods or long-distance travel. Another important factor is demography. For decades, experts had predicted that the population of Europe would decline in the 21st century. Recent developments suggest, instead, that further growth is highly probable in many European regions. 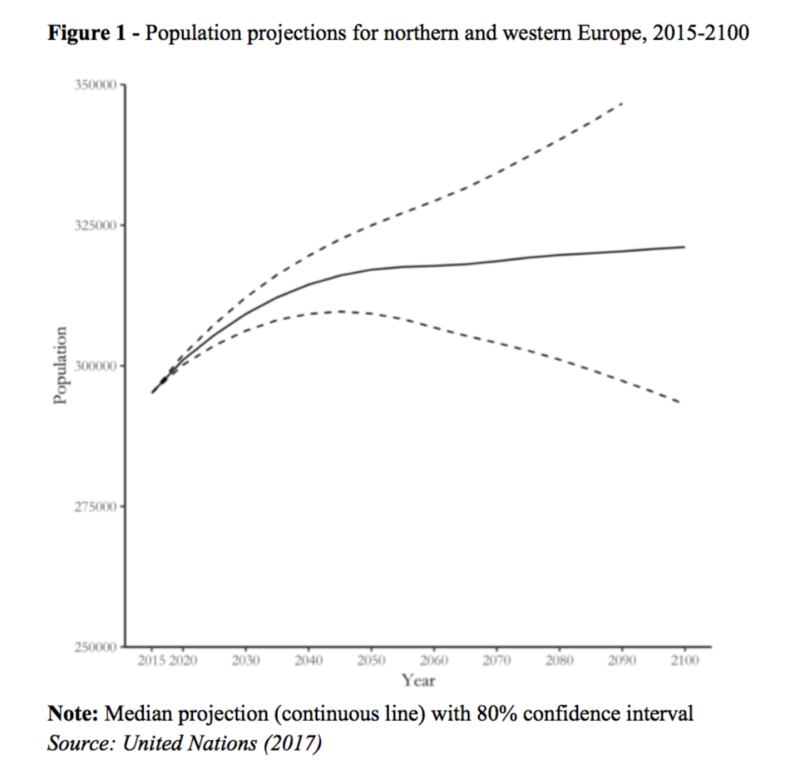 While eastern Europe is still projected to decline according to the latest United Nations (UN 2017) population prospects, western and northern Europe (i.e. the United Kingdom, Ireland, Scandinavia, the Benelux countries, France, Germany, Switzerland and Austria) will most likely witness substantial population growth in the coming decades (see Figure 1). However, there are strong regional differences within western Europe itself, as Figure 2 shows. Whereas some rural regions in central France or eastern Germany have lost population in recent years, many urban and suburban areas are growing at a substantial rate. 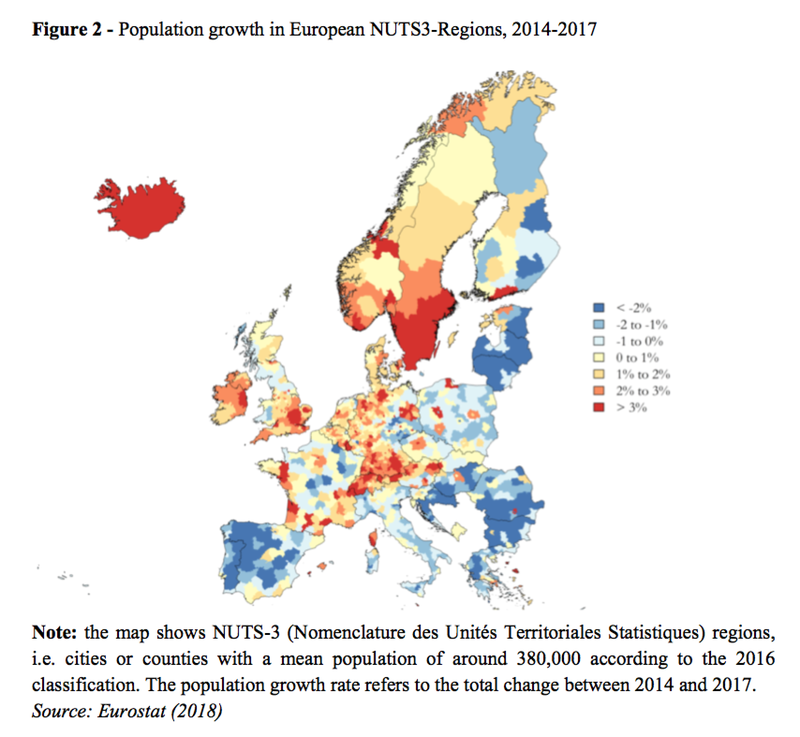 Thus, while Europe’s total population growth rate may be modest or even possibly negative in the very long run, populations are continuing to increase at a non-negligible rate in most western and northern regions of the continent. This has implications for the environment via multiple pathways. All other things being equal, more people consume more energy, produce more waste, and occupy more land. One obvious domain is the housing market. The European Union (EU) and many national governments have long pledged to limit soil sealing and urban sprawl. But with a growing population, the rising demand for new homes cannot be met solely through redensification projects within city limits. Soaring rental prices put pressure on policy makers and the construction industry to relax environmental norms and build more homes in the previously green periphery. Indeed, western European cities and regions with substantial population growth during the last decade converted a greater share of their unsealed land into urban areas than demographically stable or declining cities and regions (Weber and Sciubba 2018). Similarly, cities with no population growth were able to reduce CO2 emissions by a much larger margin than those that expanded. These findings hold when we compare cities that are very similar in terms of factors such as per-capita wealth, population density, and previous level of emissions. 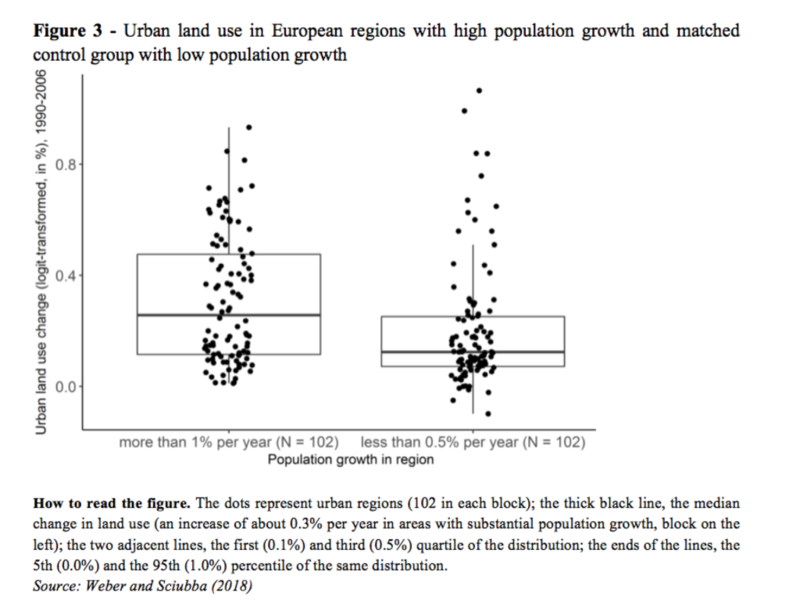 Figure 3 shows the distributions for urban land change in 102 European regions with annual population growth of 1% or more compared with 102 otherwise similar regions that experienced only marginal population growth or even decline between 1990 and 2006. Each jitter point represents one European NUTS-3 region, i.e. a city or rural county with an average population of around 380,000. Clearly, some regions with zero population growth are nevertheless converting many agricultural areas or forests into settlements or roads. However, as per the median value, the rate of urban sprawl is twice as high in the faster-growing regions. Obviously, factors other than population can be more important in some instances. In the central and eastern European countries, which mostly have declining populations, demography is not a significant factor explaining environmental degradation. In western Europe, by contrast, population growth is clearly one of the main reasons why cities are struggling to meet their environmental goals. There is no easy solution to this dilemma. Halting population growth would not save the environment and undo climate change by itself. As a first step, however, policy-makers need to acknowledge that there is a conflict of goals between pursuing population growth, maintaining or, even worse, increasing the per capita consumption of CO2-intensive goods and services, and reducing the environmental footprint of a city or country. For instance, less urban sprawl and soil sealing on the one hand, and affordable housing on the other hand, are hard to achieve at the same time under conditions of rapid expansion (i.e. a population growth rate of 1% or more, as currently seen in many regions in the west and north, see Figure 2). The link between population growth and the environment that was hotly debated in the 1960s and 1970s has virtually disappeared from public discourse in the past decades. Notwithstanding, the data suggest this relationship is very much alive. Population growth is not necessarily a bad thing in every respect. But there is a clear trade-off between growth and environmental sustainability. Policy makers need to be vocal about where their priorities lie. This might involve abandoning long-held policy preferences in one domain in favor of others. 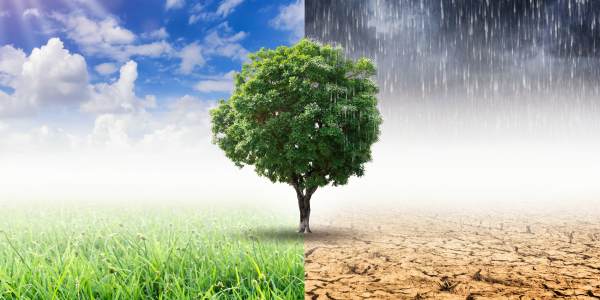 Voters can then make a deliberate choice for or against policy programs that give precedence to environmental sustainability and the fight against climate change. United Nations (2017). World Population Prospects. The 2017 Revision. New York: United Nations. Weber, H., Sciubba, J.D. (2018). “The Effect of Population Growth on the Environment: Evidence from European Regions”, in: European Journal of Population, Online First.